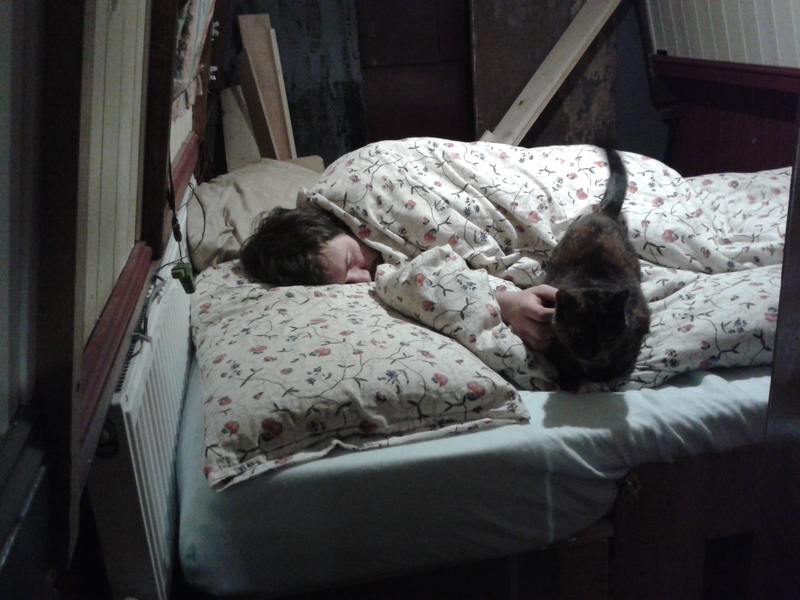 The bed which James made for Willow was always supposed to be temporary. It was built along the length of the bedroom, leaving little room for any clothes storage or furniture. We really wanted a ‘cross’ bed, which can fold out across the width of the boat at night or fold up during the day and leave space to pass by it. This would also leave space either side of the bed for a wardrobe, chest of drawers and a nightstand. First job was to remove all the stuff from under the bed which had been stored there and put it in the living room (which now looks like we’ve only just moved in!) 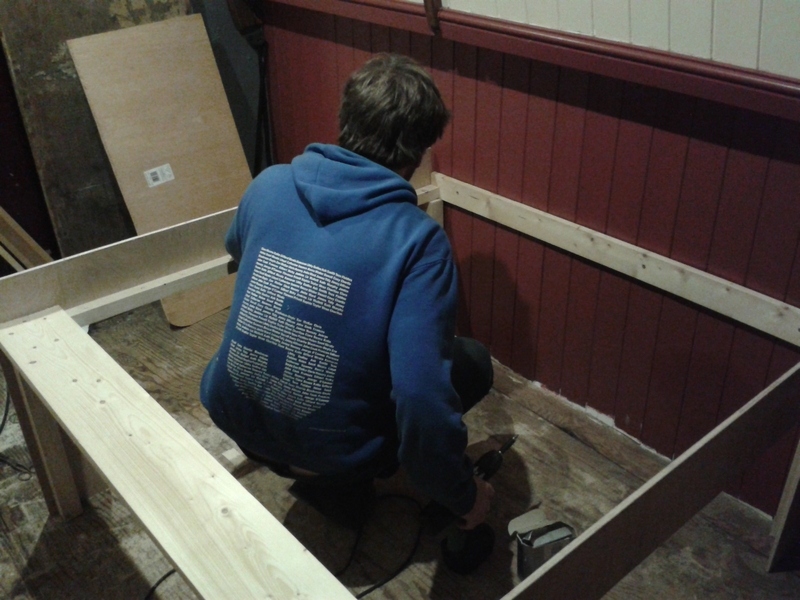 Then, James dismantled the old bed and reused the wood to make the main, fixed part of the bed. We made life easier for ourselves by sticking to the dimensions of standard pieces of ply which are available from B&Q. The folding out part is a piece of ply which came with the boat and it’s really thick. We used a piano hinge for the fold out part, currently supported by legs which also fold out from the fixed part. We’d like to work out a way to have that folding out part hinged in two so that it doesn’t stick up so much when folded. 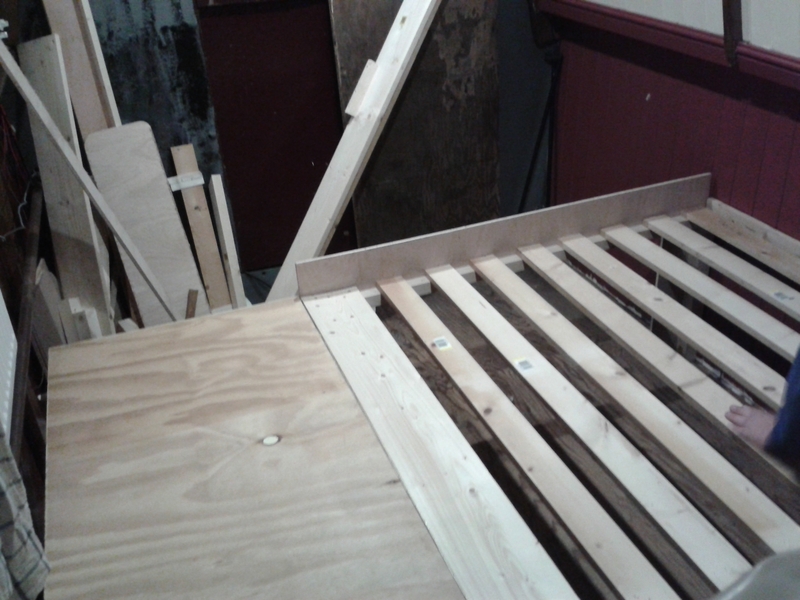 The mattress is a memory foam topped one, chosen because it can be cut to size. We cut a strip off, to make it just under 4ft wide, and then zipped it back into its cover, which still fits pretty well – it would have been a squeeze to get a full sized one back into it I think! Then, to help it fold we cut a slit in the underside of it, just part way through the foam so that from the top it doesn’t feel any different. 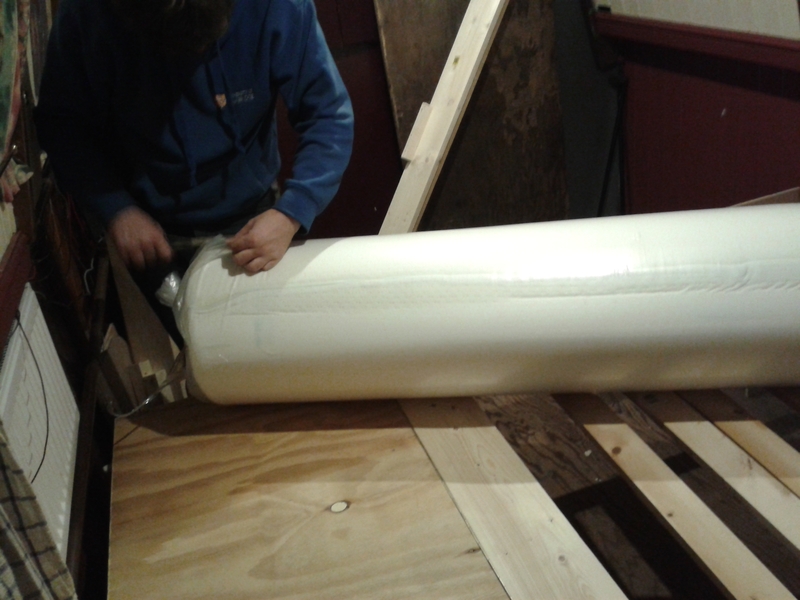 Our old mattress will be finding a new home on the good ship Bones! What have we been up to recently? Last weekend we drove (!) out to St Ives for diesel then spent Saturday evening out of town, on the GOBA moorings with our friends from ‘the Parish”, our old mooring. Then on the Sunday we picked up my sister and her boyfriend at Waterbeach to cruise back into town. It was fairly eventful, as we stopped to pick up a bag of wood from a fellow boater and rescued a plastic cruiser which had drifted off its moorings! Today we made use of the new motor to go and fetch some wood. 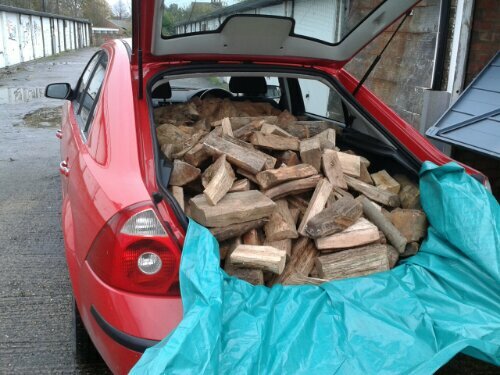 We’ve got some green wood seasoning in the garage but that’s no good to burn yet so we bought a car load of hardwood from a farm just outside Cambridge. (The construction place we’ve got wood from before was out of stock). This is why I’m glad we didn’t get a super mini! Meet Jasper the Ford. After years of carlessness we finally bought a motor so that we can more easily visit all those canal festivals, meetings and family gatherings that we have always used public transport to get to before. 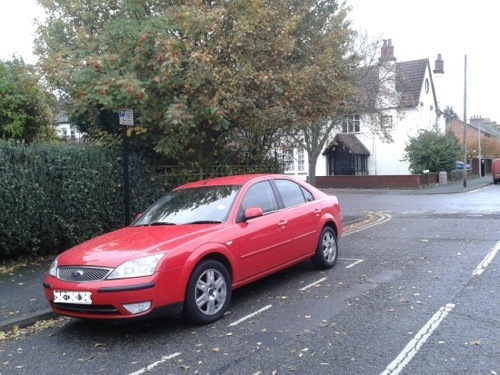 It’s a 2004 2.0 l automatic Ford Mondeo, bought from a village car dealership near St Ives for a pretty good price because its got the odd little scratch. But it’s a newer car than we were expecting to be able to afford. Additionally its only had 1 owner from new and came with full service history which is a bonus. I like that it’s bright red but otherwise it’s fairly bog standard. We’re lucky that because we’ve got a bona fide residential mooring, we can get a parking permit for it in a nearby street to the river. It’s still a 5 min walk away though, so we won’t be popping out for a pint of milk in the car, but saving it for when we really need it, like collecting our new fenders and the 2nd hand generator we’ve just had a friend pick up for us in Shropshire which we need to collect when we next see them! I expect we will take the odd frivolous trip to the seaside though, or to other places we can’t get to by train and bus! The possibilities are endless! The biggest fireworks display in Cambridge is held in our “back garden”, Midsummer Common. 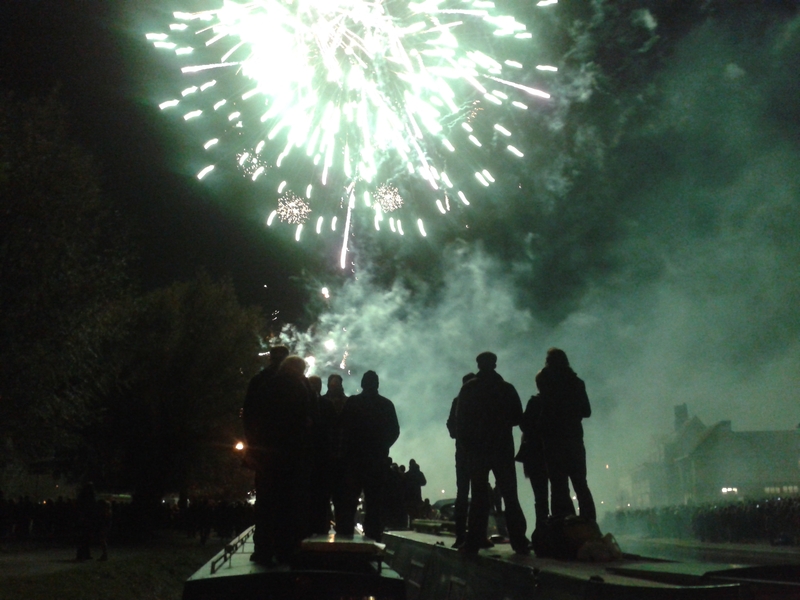 It’s a great occasion for boaters, as although there’s a bit of disruption and a large influx of visitors, we all get together and hold parties on our boats, spending time on different boats as the night goes on! It was the first big party we’d held on Willow, and the main reason we’d pushed to get the sink plumbed in! It was a great display, with the wind direction meaning that the fireworks happened over the river, with us getting a good view from the roof of the boat. We served up mulled wine and hot chocolate, and engaged party mode on the boat – pushed the big furniture to the edges to leave space in the middle for lots of smaller chairs. The counter top above the extra cupboards towards the front of the saloon served admirably as a place to put nibbles, a use we’d not really thought of. It was great to see everyone, and a good night was had by all I think! We had our friend’s dutch barge style boat, Bunty, breasted up to us, as well as a little plastic cruiser, and later on, James steered Bunty back home. We then hitched a ride back to Willow on Richard’s boat, Steadfast! They estimated 25000 people came to watch -you can see in this photo the sheer numbers on both sides of the river! We definitely get the best deal, no crowds and a great view! We bought this “late Victorian” wash stand months and months ago, just after we bought Willow. In fact, it was the first thing we bought for the boat. It was a charity shop find – from Oxfam on Burleigh Street. The lovely enamel sink came from eBay, and the holes in the marble top were drilled by Hibbitt’s (monumental masons). The taps are from B&Q! Oh yes, and the the mirror above the sink is a Willow original – made by her previous owner. 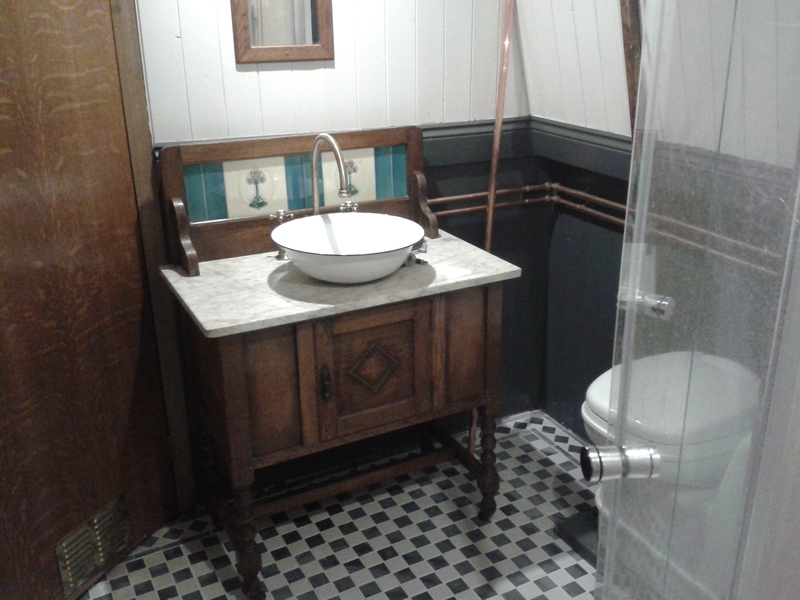 The decision to use this washstand and repurpose it as a plumbed in sink had a knock on effect for the rest of the boat’s design – using it meant that the bathshower room had to be pretty big, which in turn affected where we could put the bulkheads. But we are really glad that we persevered with the idea. 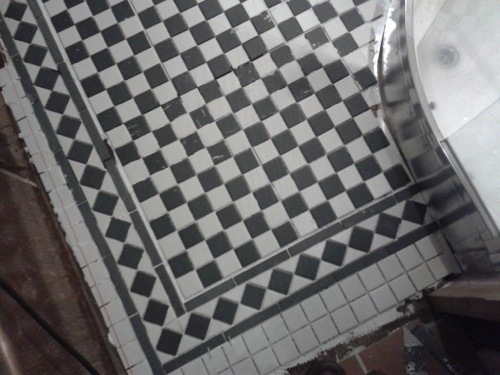 Last night, after the grouting which I’d applied in the afternoon was dry, we moved it into place and James began the task of plumbing it in. The taps now work, but it got too late to finish the waste pipe, so the sink currently drains into a plastic washing up bowl underneath! It being half term for James this week, we took a couple of days to go away. Not for us the romance of Paris! No, instead we enjoyed the rather more prosaic delights of Gloucester.The reason for choosing this as the destination for our little holiday were twofold. Firstly, it is where Willow was based in its Severn and Canal days, and where some archival documents are held, and secondly, Willow’s older sister by a few months, Oak lives there, at the Waterways Museum. We’ll go into more detail about what we learned about Oak at the museum and the Gloucestershire Archives in another post. For now I’ll just describe our trip. 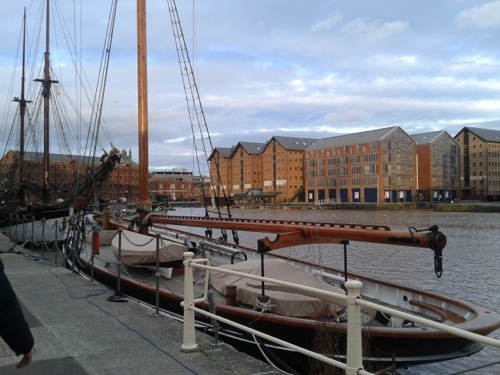 We arrived in Gloucester at midday and headed straight to the Waterways Museum in the docks. Martin, who looks after the boats, was there to meet us. He showed us what information the museum has on Oak and then we went over to the boat itself. 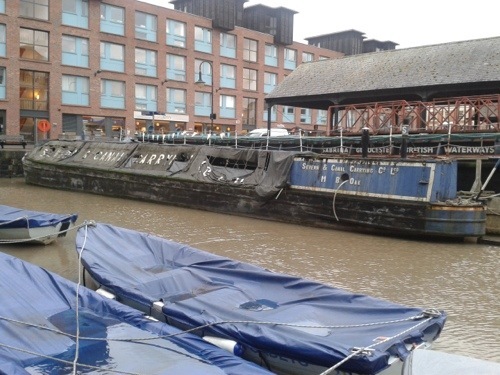 Sadly there is no funding to restore the boat, which is in a very sorry state. All the museum can do is pump it out, and no one goes inside. It took a while to find the right key to the back cabin, and we had to sign disclaimers to say that if we hurt ourselves whilst on the boat we were acting at our own risk and wouldn’t sue C&RT! Thankfully it was a good day so it was dry underfoot and we’ve actually been on worse boats before! 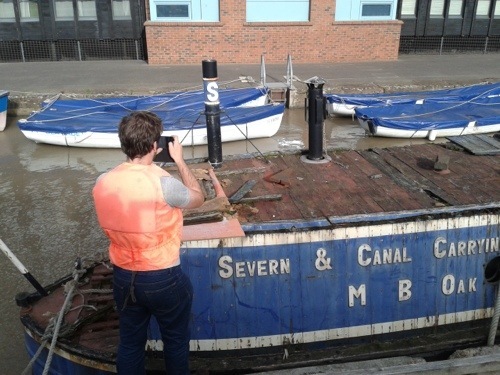 We took loads of photos, then were showed round the museum’s other boats: the FMC butty Northwich, river class butty Wye and the tug Severn Progress. We were treated like VIPs and everyone was really friendly. After a cup of tea we went off and looked round the museum on our own, then bought things in the gift shop on the way out. 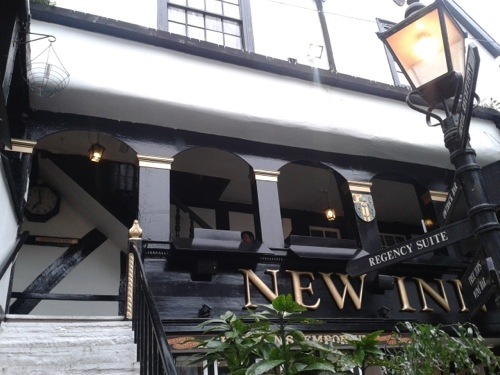 We then headed into the town to check in at our hotel, the New Inn, which is in fact really old! Part of dates from the fourteenth century and it has the “finest surviving example” of a medieval gallery in the country. We loved the building, and it was very good value. Our room was decorated fairly mundanely but it was clean, and had loads of medieval character in the form of exposed beams. Including breakfast, it only cost £58 for the night. In the evening we went out for drinks and a curry with some old friends who live in the area and whom we’d not seen for about 6 years! It was lovely to catch up and the Indian we went to, Aroma, was really very good. Definitely recommended. The next morning, fuelled by a full english breakfast we hit the Gloucestershire Archives. I’d pre-ordered the documents we wanted to look at and we had an appointment to meet Hugh Conway-Jones, author of several books on Severn and Canal including the excellent Working Life on Severn and Canal. We had hoped to see general arrangement drawings (showing the details of the boat) for both Oak and Ash, as well as the six later Severners (including Willow). Between the first two prototypes and the last six there were changes made to the design and we’d hoped to be able to pick these out. Alas, the drawings for the final 6 were in too bad a state to be viewed, and they are low priority for digitisation. We’re still going to ask though. It was great to meet Hugh, and he showed us that we could look up the names and details of all of the steerers of the Severn and Canal boats which were documented by the Health Inspectors. In the afternoon we went to explore the area a bit more. 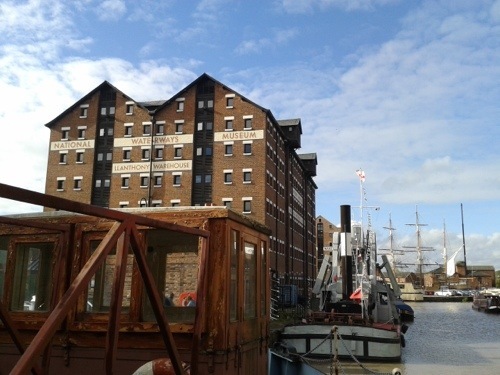 The docks area is being rejuvenated and there are walks to be had along both the Gloucester and Sharpness Canal and the Severn. We didn’t go very far in either direction but enjoyed it all the same. 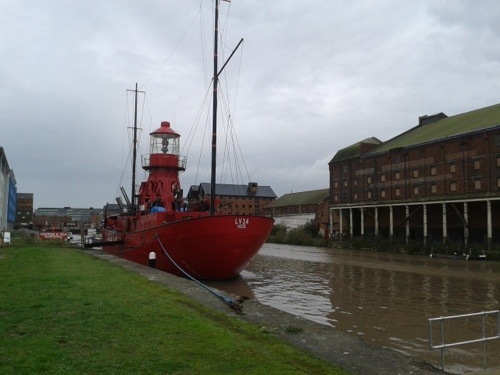 Highlights included the Gloucester Buddhist Centre which is housed in a lightship (!) 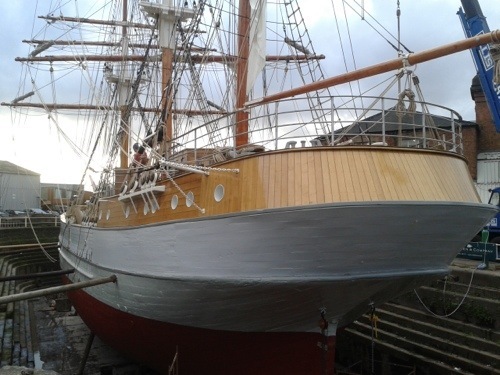 and a three masted schooner which was being worked on in Neilsen’s dry dock. Having sorted the leak in the shower waste plumbing, James got on with sticking down the bathroom floor tiles earlier this week. Today he cut all the fiddly little ones which go around the base of the shower. They need grouting (tomorrow’s job) but they are looking lovely I think! 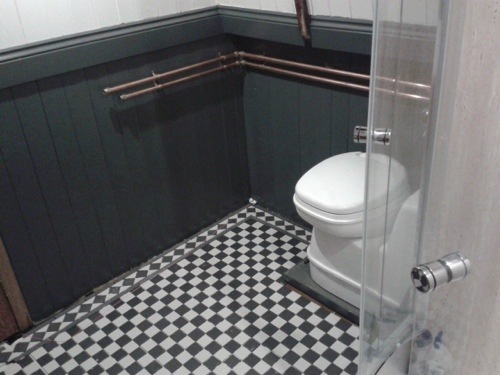 These photos give an impression of the look we’re going for in the bathroom. Soon we’ll have the sink/washstand plumbed in too – we found a fitting which will go on to the mystery thread on the bottom of the enamel sink!